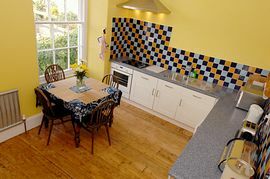 The upper half of this beautiful sea-side house has been carefully refurbished to create comfortable accommodation for up to five people. 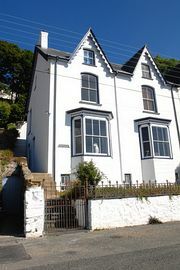 Accommodation comprises of a spacious master bedroom with an adjoining single annex and an airy twin room, all with stunning views over Fishguard Bay and across to Dinas Head. The lounge has uninterrupted sea views, comfy sofas and sculptures and artwork to enjoy. An up to date fitted kitchen has all modern amenities. The bathroom is large and has a shower, bath and toilet along with unique marble detailing. The top of the house is completely self contained, it has its own separate entrance as well as a patio and a barbeque terrace. 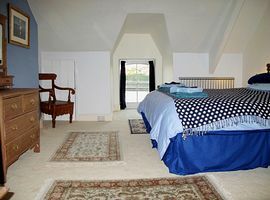 The property is centrally heated throughout, so it is ideal for winter and summer breaks. It also has a wireless broadband signal in all the rooms. Located in Goodwick, Siriole is two minutes from the shops, pubs and restaurants of the village. Within easy walking distance of the Pembrokeshire coast path and close to the Fishguard to Rosslare ferry and the London train, use Siriole as your base to explore all that the beautiful county of Pembrokeshire has to offer. Unique stone features crafted by sculptor Darren Yeadon. Outside the property there is a small patio and a barbeque terrace. Local Services: A two minute walk from the village of Goodwick which has pubs, restaurants, cafes, an excellent butcher's and grocers, news agent, library, hairdresser and post office. 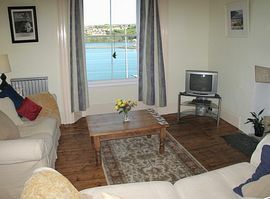 Within walking distance of Fishguard Harbour from where you can take the ferry or SeaCat to Ireland or the train to London. 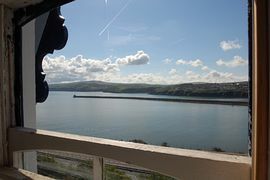 A ten minute walk from Goodwick Parrog which has a small beach, a children's play park, the award winning Ocean Lab, two cafes, a petrol station and a small supermarket. From £295.00 to £595.00 depending on the time of year. Please see owner's website for more details.